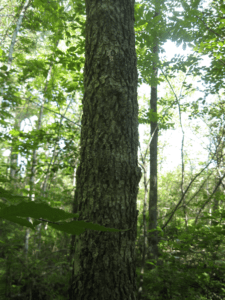 Although any tree pest is worrisome, emerald ash borer is to blame for the death of millions of ash trees in 27 states—becoming a particularly prevalent concern in the state of New Jersey. 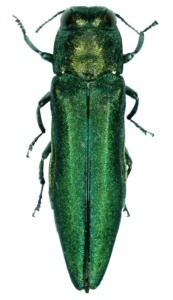 Native to Asia, emerald ash borer is an insect pest that infects and kills ash trees. The pest was first discovered in the United States June 2002, and was likely unknowingly introduced ten years before. As an adult, the insect is about a half-inch long and an 1/8-inch-wide, with a metallic green body and copper red underbelly. The larvae, which cause the most severe damage, are white or cream colored with an inch-long body made of ten bell-shaped abdominal segments. While white and black ash are particularly susceptible to emerald ash borer, all ash trees are at risk. Adult emerald ash borer feed on margins of the ash leaf; after feeding, the female lays eggs under the bark flaps on the trunk of the ash tree. The larvae later tunnel further into the bark, feeding on the cambium—the layer of the tree that transports nutrients and water. Adult beetles surface in May or early June, leaving a three to four millimeter hole in the tree, shaped like the capital letter D. These D-shaped exit holes are found on the branches and trunks of the ash trees. Continuing the cycle, the adult beetle feeds on ash leaves until August. Altogether, the lifecycle of an emerald ash borer is a full year. Ultimately, trees will only live about three to four years after an infestation. This symptom is the result of years’ worth of emerald ash borer feeding. Dead branches, leaf loss, discoloration, and thinning beginning at the top of the tree are all signs to watch for. Look out for splits in the bark that run vertically up the tree. This is caused by callus tissue, developed around the larvae galleries. These splits can often reveal the galleries beneath the bark. Although these D-shaped emergence holes are more often found higher in the tree canopy, they can also be found lower on the trunk as the infestation progresses. When trees are sick due to an infestation, branches and leaves will attempt to grow wherever possible. During an emerald ash infestation, these branches tend to sprout out below the larvae are feeding and often at the base of the trunk. If you happen get a view under the bark of your ash tree, look for s-shaped tube designs caused by larval feeding in which the pests wind back and forth along the tree. These galleries are full of frass and sawdust. Additionally, check for the cream colored larvae or adult beetles themselves around your ash trees. Ash is a popular species within our state. As a homeowner or landowner it’s important to identify any ash trees on your property, and prepare for emerald ash borer. Find out how much ash you have on your property, the size, and location. Make sure to identify and monitor ash trees on your property, looking for any of the signs of the sympt oms listed. You may use traps to detect the insects, and make sure to report any sightings. 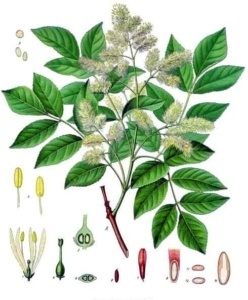 Most importantly, ash trees can be treated to prevent infestation. Contact Friendly Tree today for assistance in your ash tree protection.